Years ago a co-worker who knew how much I loved to cook, gifted me a copy of the Silver Palate Cookbook, written by Julee Rosso and Sheila Lukins. This cookbook is a collection of well-loved recipes from the 1970's Manhattan gourmet take-out shop with the same name. One of the most popular dishes on the menu, which later became a classic party dish in the 1980's, was the Chicken Marbella. 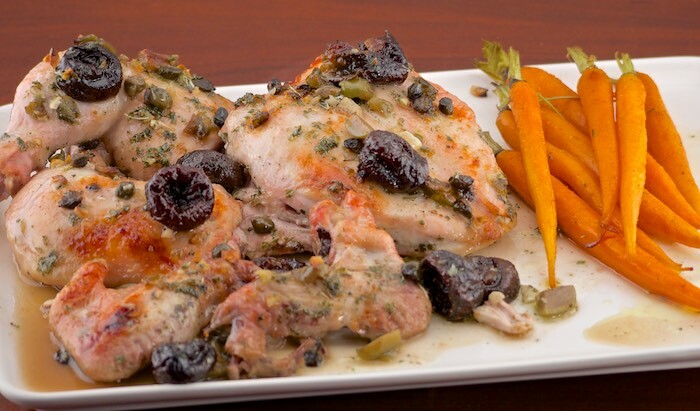 A Mediterranean inspired recipe featuring chicken marinated overnight in a combination of green olives, capers and prunes, then baked with brown sugar and white wine. Though I've had this book for several years, and have cooked from it a ton, I am just recently getting around to making Chicken Marbella. This recipe produces a moist chicken that is delicious served hot over rice or equally as good served as a cold salad. I know I will be making this again and again. This is one of my all-time favorite recipes from one of my all-time favorite cookbooks! I love baking with prunes and can imagine how lovely it is to make a savory dish with them! I have that cookbook too. It is phenomenal. Glad you brought it's memory and I love add prunes to my dishes. I have the Silver Palate cookbook on my shelf, but I haven't pulled it out for a long time. Looking at this dish makes me want to change that! mmm that would be perfect over a bed of white rice! I may have to find myself a copy of that cookbook! This looks so tasty. Perfect for a weeknight meal. Pinning!